One of the most satisfying things about being a physics teacher is seeing students move on and pursue degrees and careers in physics and engineering. I try to accomplish this by engaging students with demonstrations, lab activities, and bringing in real-life application to classroom work. I also believe that the most impactful experiences for students happen outside of the classroom in the form of extracurricular projects and competitions, and of course field trips. As a physics teacher in Georgia the most obvious field trip to take was to "Physics Day" at the Six Flags Over Georgia amusement park. I went as a student and enjoyed the various demos and questions to answer for each ride. As a teacher, however, my plans to take my students to Physics Day were thwarted by a county administration that felt that "Atlanta was a dangerous place" and unless all 100+ students of mine held hands and went through each ride together, surely one of these 17-18 year olds would get lost. The only field trip I was able to pull off was with my Engineering Club that took two annual trips down to a much worse part of Atlanta to compete in an engineering competition and tour the Georgia Tech campus. These trips were influential, in my opinion, in leading several of my students into pursuing engineering degrees. Now as a teacher at an international school in Germany I have had a few more opportunities open up for field trips. 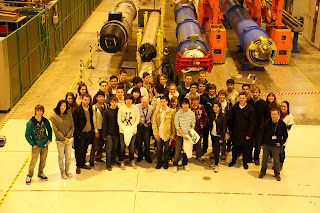 Last week I was able to accompany 30 of our students to Geneva, Switzerland on a field trip to arguably the most important research facility in the world for particle physics - the European Organization for Nuclear Research, better known as CERN. I consider it to be a once-in-a-lifetime opportunity for an American physics teacher, and it lived up to all of my expectations. Holding on for dear life as to not be accelerated along this old piece of magnetic track. That's the size tunnel you need to accelerate some particles. "The Globe" exhibit on the CERN site. Inside you can look at real-time data being collected at the various experiment control centers as well as a sweet light board that detects muons showering down on us due to cosmic rays coming from space. While this may look like one of the nightclubs we hit up in Geneva with our students, it's actually inside the "Globe" exhibit. 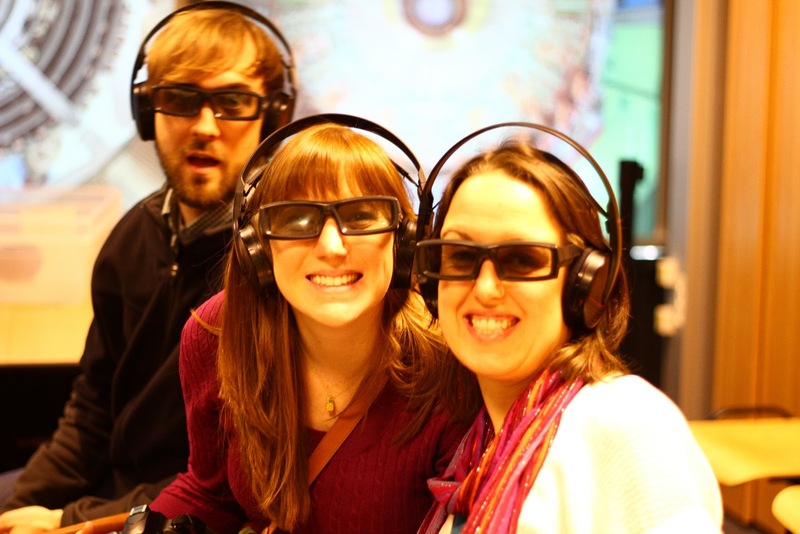 The little pods have audio that explains different aspects of particle physics research. CERN is the largest international particle physics research facility in the world with researchers from over 100 countries working collaboratively to answer a few fundamental questions: What is our Universe made of? Where does it come from? Why does it behave as it does? It was put into place in the 1950's in an effort to stop all of the European physicists from emigrating to the United States to contribute to progress of their atomic physics research which had already demonstrated its dominance with the development of the atomic bomb (with much help from European physicists). Today, nations from every continent contribute money, researchers, and other resources to CERN in a worldwide effort to further our understanding of the structure of our Universe. In recent years you may have heard of CERN while reading Dan Brown's "Angels and Demons", or you may have heard all of the headlines in 2008/2009 when there was supposedly this device in Europe that was going to create a black hole that was going to destroy the earth and many scientists around the world were concerned about it. Well, this doomsday device is exactly what we went to see. Formally known as the Large Hadron Collider (LHC), it is a 27 km long magnetic tunnel situated 100 meters under ground that accelerates particles to speeds near the speed of light to have enough energy to collide and create new particles for physicists to detect and study. On this one track there are four major experiments that are going on to essentially answer the same questions using different equipment. At the testing facility we saw this cross-section of the large toroid magnetic track shown earlier. 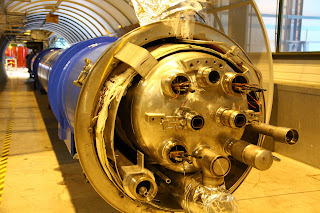 This is some very expensive, high precision equipment that allows for large currents (on the order of 10,000 Amps) to move through to generate a magnetic field inside the two vacuum tunnels for the particles (center left and right) while at the same time allowing liquid helium to be pumped through to bring the temperature down to near absolute zero (-273 degrees Celsius) so that the magnet can have superconductive properties. The magnetic track comes in sections that you saw above that must join together to form a 27 km. The engineering challenge is to ensure that the junction between each section is uniform in conductive properties (no extra resistance where the two join together) and they should be able to handle the significant thermal contraction/expansion as they are cooled down from room temperature to near absolute zero. This is the solution. Note that in 2009 when researchers first fired this bad boy up, there was a huge electrical failure that ruined sections of the track, caused millions of Euros in damages, and set the project back by about one year. This failure had to do with the presence of extra resistance at some of the junctions which caused the track to heat up (due to 10,000 Amps passing through) and thus, causing the magnets to lose superconductivity. In laymans terms, it was an "epic fail". Another view of one of the ends where you can see all of the piping that carries various coolants throughout the track. CERN scientists typically design this kind of equipment and contractors from around the world bid to make them for the facility. All of this just to make some protons and lead ions move at near the speed of light (300,000,000 meters/sec)! 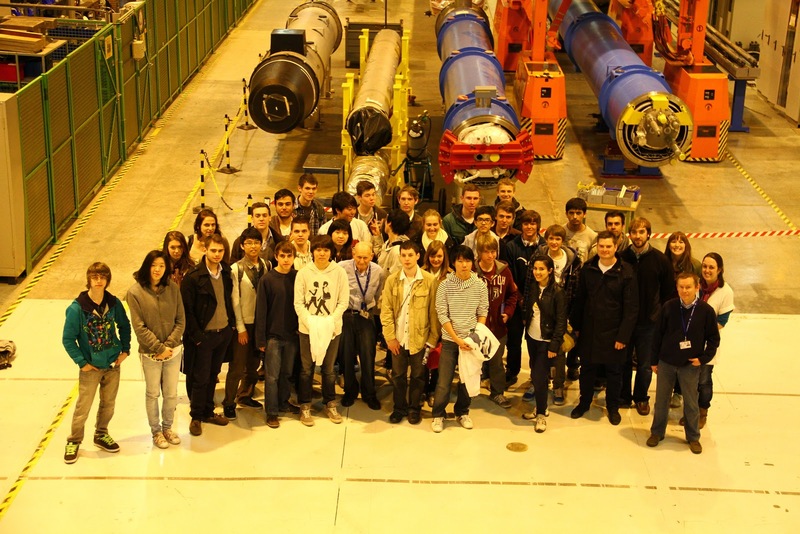 Our students were able to tour the facility with a guide named Klaus, who is a retired physicist who had worked at CERN. We had a background lecture on the physics behind the research, the history of the facility, and the goals of the research. Then we were able to visit the control room of one of the main experiments (ATLAS), the testing facility for the large pieces of the magnetic track, and a couple of the public exhibitions on site. It was an information overload for myself and our students - I like to call it an "all-you-can-learn buffet". Here I am "blowing it up" outside of the ATLAS detector - this is one part of the track where the particles can collide and be detected. The fancy mural gives you a nice dissected view of the detector with lots of expensive equipment used to detect various types of particles and radiations. 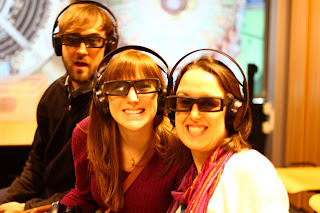 Watching the 3D movie of what goes on at the ATLAS experiment with Marisa and our co-worker Kate. Our entire group of future scientists and engineers at the testing center along with Klaus in the center. Overall it was an amazing experience - one that I'll never forget. I hope to be able to have these experiences for my students wherever I go. 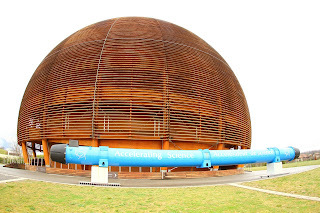 I also suggest that if you find yourself in Geneva to take a day to visit CERN. Even Marisa, who doesn't care anything about physics, enjoyed herself and found it interesting. For more information, go to: www.cern.ch.